Perfectly Imperfect: Richie's Day At The Spa! Richie's Day At The Spa! Richie was so lucky to be treated to a day out at Juz Purrfect, a hot new pet salon at Buona Vista. 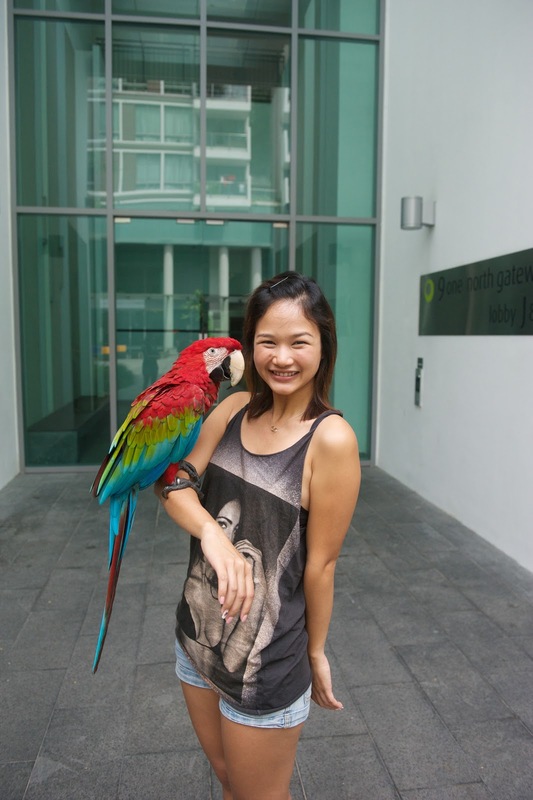 Situated in a cozy corner of Buona Vista surrounded by lush greenery, it was the PURRFECT place for Richie to let loose, and take a spa day off! 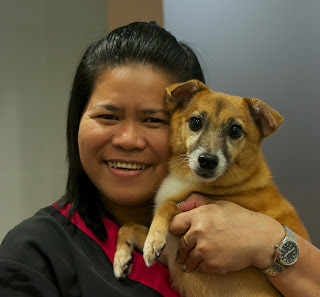 Owners Sue-Lyn and Yeewei were really wonderful and friendly, and sang high praises of Emma, their star groomer, who has over 10 years of pet grooming experience under her belt. In fact, she specializes in grooming cats. CATS!?! "Cats can be groomed?" Yeap, that was my initial reaction. But she does such a good job of it that she has regular customers coming from far and wide. 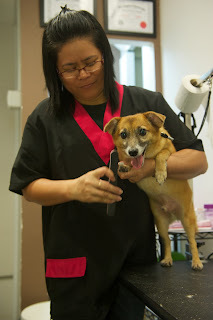 I heard she even has a regular that travels all the way down from Yio Chu Kang to Buona Vista just to get her furkids groomed by Emma! This is THEIR PET sitting on me. 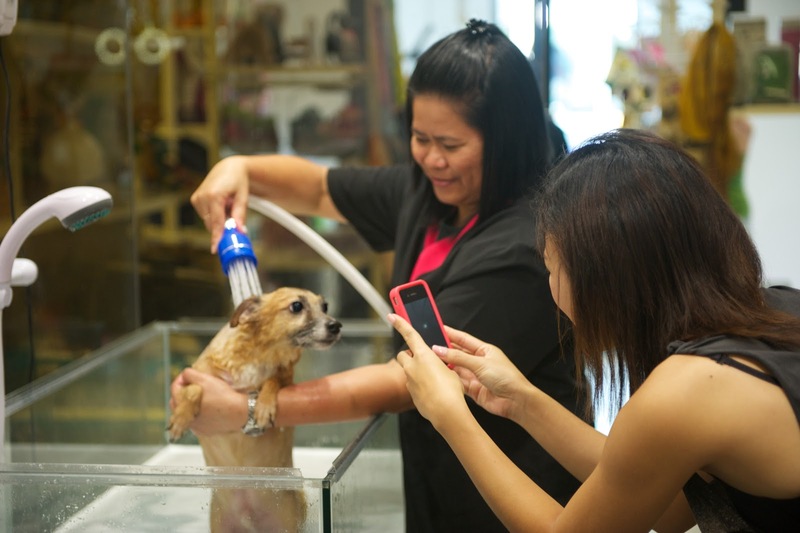 The owners themselves are no strangers to pet grooming. They started off as "Holland V Pet-Sitter". Just a few years ago, pet sitting (also known as in-home care) was an unheard of pet care service in Singapore. But with the increase in pet ownership in Singapore, and the specific and differing needs of owners, be it work, travel or social, there inevitably was an urgent need for high quality and loving pet care. And the Holland V Pet-Sitter was there just to provide that service. Surely, their business has grown, and now, on top of the tons of devoted regular human customers, they've also got a whole bunch of furry friends who thoroughly enjoy spending a day out at their shop. That said, back to Richie who was busy sniffing around the shop and making friends with Emma. Emma started him off with a full grooming where she swiftly trimmed his nails, cleaned his ears, cut off the extra fur on his pawpads, and shaved off all his extra bumbum fur. Then, she utilized this special comb to get rid of his undercoat. Now, Richie may have short fur, but that dog sheds like nobody's business. Within minutes, it looked like some fur massacre was happening, and Richie was thoroughly enjoying himself. It must've been really comfortable for him to get rid of all that fur. Firstly, the weather is so hot here, he really doesn't need that undercoat, and secondly, I heard that (don't quote me) when it starts to shed, it actually causes the dog to itch. So can you imagine having an itch at a spot you can't reach?!? And finally, someone is helping you to scratch it off! Waaaah. 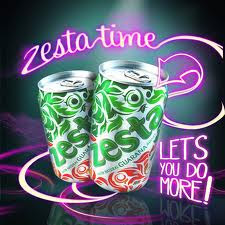 Shiok. Finally, after all that excess fur was OFF, OVER and DONE With, it was the moment we've all been waiting for... SPA TIME!!! Richie popped into the Nano Micro Bubble Spa. These nano micro bubbles can penetrate deeply into the skin for a good scrub without the need for any shampoo or soap. If you want to, though, you can opt to put shampoo in there as well. Needless to say, the baths are especially helpful for pets who have skin allergies or sensitive skin. The bubbles are negatively Ion-charged when they leave the shower head which attracts unwanted particles and dirt in the water. The negative charge of the bubbles attaches to the dirt, allowing the bubbles to carry the dirt away from the skin pores and hair follicles unlike regular bath water. The tiny micro bubbles massage the skin surface, stimulating circulation and the tiny bubble size provides vastly more surface area for oxygen to be transferred. 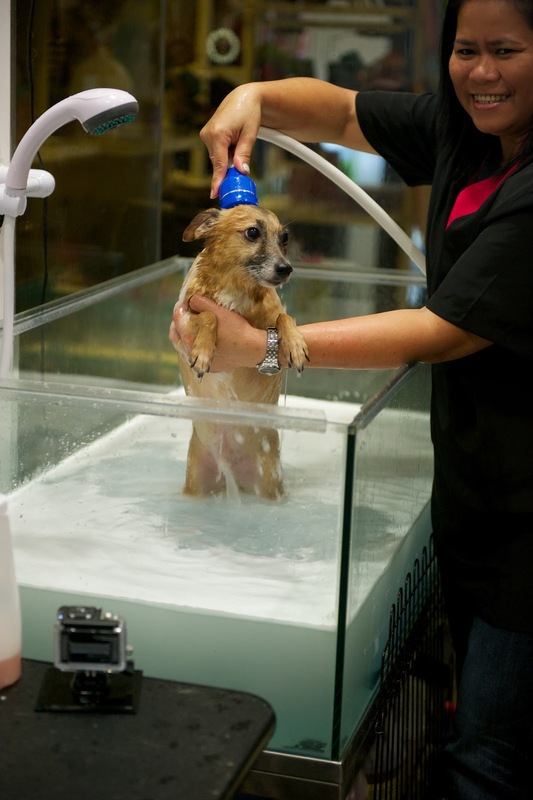 No matter what type of coat your dog has, the micro bubble will easily penetrate until it reaches the skin pore, making bathing time easy, healthy and fast. 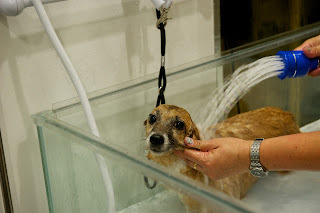 Richie was enjoying himself so much, and I can now see why this skin treatment is popular in some pet spas in Japan as well as shops specializing in grooming pets. Not long after, Richie was done, and my, not only was he smelling pretty, he also looked handsome and YOUNG AGAIN! hahahaha Just like when he was a pup. Thanks Emma, Yee Wei and Sue-Lyn! We had a wonderful time!